this authentic 1930’s gas station, located on the corner of Routes 66 & 17, has been restored to serve as a Welcome Center for the Village of Dwight. The station was named to the Route 66 Association Hall of Fame in 2005, and is listed on the National Register of Historic Places. This bank, founded April 10, 1855, is the 3rd oldest bank in Illinois. The Greek classic designed building, built in 1910, remains the same except for two canopies. In 1974 the interior was expanded and remodeled, though the original farm scene murals painted byViennese artist, Oskar Gross, still exist. Built in 1891, originated as the Scott House, a twenty room Victorian boarding house. In 1895, the home was elaborately renovated and used as a private home by John Oughton, one of the founders of the Keeley Institute. Finally, in 1977, the home was remodeled and opened as The Country Mansion. The home has been on The National Register of Historic Places since September 23, 1980. Come and visit this wonderful farm that is home to Suri Alpacas, llamas, Turkish Akbash livestock guardian dogs, chickens, ducks, cats, and Patagonian Maras. Whether you’re an alpaca owner, researcher, or just coming for a visit, this farm is here to help you! 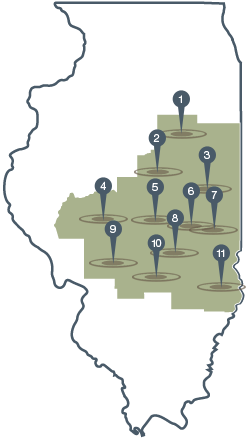 This State of Illinois Residential facility provides support and service to people with developmental disabilities. It is the original site of the Keeley Institute, a world renowned center for the treatment of alcoholism, and also the Livingston Hotel. Art glass windows, by Louis J. Millet can be seen above the main entrance, each window signifying one of the five senses. Best dirt track racing in the Midwest. UMP modified, UMP late models & Street Stocks. Racing every Sat, mid-May through Labor Day weekend. Time Trials 6:30pm with racing @ 7:30pm. 11289 E 2100 North Rd. Located just 5 miles north of open every day of the year. The park has 5 miles of trails through 300 acres of woods. Visitors can choose from a primitive trail or The Fox Trail for those who need sure footing and/or a hard surface for wheel chairs. The park boasts 30 types of trees, over the 15 acres of prairie, lots of wildlife, and areas for skiing in the winter. Stop to take a look at this life size statue of Abraham Lincoln while you are in town. Designed by sculptor Rick Harney, it is a memorial to the numerous visits Lincoln made to Pontiac between 1840 and 1860. Located on the downtown square, this beautiful building, built in 1875, is listed on the National Register of Historic Places. housed in Pontiac’s historic Old City Hall and firehouse, the Old City Hall Shoppes present a delightfully unique shopping experience. Twenty shops under one roof, offering everything from antiques, handmade items and gifts, to home accents, souvenirs and more. There is truly something for everyone! The history of the Oakland and Pontiac car brands as seen through 15 classic cars, dealer artifacts, a complete print library and memorabilia. Free admission. Situated along the Vermilion River, Streator proudly promotes itself as a “Quiet Surprise on the Prairie.” You are invited to come wander the tree lined streets where you will find the quiet, caring atmosphere of small town America. Streator is rich in history, architecture and charm, and offers many events and attractions to visitors. Visitors will enjoy this surprisingly well equipped community theatre that offers top quality entertainment every summer. Established in 1957, this sprawling complex, devoted exclusively to live theater, sits amid beautiful gardens. Six shows are produced each season, which runs from early May through late August. Follow this trail through an urban forest of mulberry, hackberry, oak, and maple as it winds along the banks of the Vermilion River, passing Cassidy creator, Clarence Mulford’s boyhood home. Enjoy fishing, hiking, or canoeing from the convenient, downtown canoe landing, which provides a great launch site for adventurers. Visitors can come to this site and view monuments and plaques honoring servicemen in the Revolutionary War, Civil War, WW I, WW II, Korean War and Vietnam Conflict. The Weber House is a storybook Tudor cottage, which sits in an English garden of meandering paths, roses, hollyhocks and old oaks. Inside, cozy candlelit rooms reflect the 18th century. The history of Weber House is interlaced with the rich and famous. It has received visits from an Academy Award winning actress, television stars, presidents, and more, not to mention a major gossip columnist who wrote about them all!